Councilman Lew Fidler recently held a meeting held to have the community input their voices into what would be the new Gerritsen Avenue north of avenue U. The DOT plan includes installing bike lanes, making the lanes narrower, and of course a single lane (north and south) with a wide median ending at Nostrand Avenue. This has all designed to slow down traffic for good reason too, the average speed on Gerritsen Avenue according to their published reports is 40-50MPH. With all of the elected officials and community leaders in the room the main concern at the meeting was the addition of bike lanes. Everyone agreed that they were a bad idea. The meeting argued against them citing amongst other things that no one would use them, and safety concerns because Cars, Trucks, and Buses would be sharing a lane along with the bikes. They even suggested Stewart and Burnett streets as viable alternates for bike lanes.. Commissioner Palmieri informed the group that the bike lanes would remain, as proposed, effectively brushing the room off. Since that is the way that they were designated in the â€œmaster planâ€, designed approximately 10 years ago. Councilman Fidler saidÂ that this is unacceptable, and urged Borough Commissioner Palmieri to speak with NYC DOT Commissioner Sadik-Khan, stating that this could be revised cooperatively or through legislation that he would introduce as early as next week, if necessary. It should be noted that these changes were scheduled to have already been installed. However, Councilman Fidler insisted that no work be done until the community was able to review the proposal. Here are some notes sent in by Councilman Lew Fidlers office of the concerns of the people in attendance. On top of discussing the proposed changes Councilman Fidler requested that DOT re-examine recent changes at the intersection of Gerritsen and Nostrand Avenues, as southbound Nostrand Avenue traffic who wait at the red signal to turn left onto Gerritsen Avenue are forced to wait in the middle of oncoming traffic, leaving them vulnerable. Councilman Fidler also requested that the south fork of Avenue U aka Avenue U South, be re-evaluated. 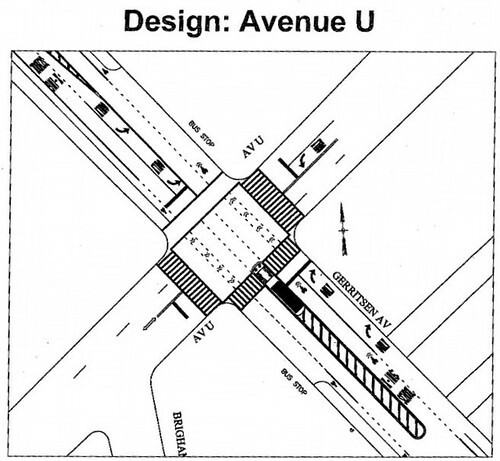 This two-block branch of Avenue U has been the subject of concern and reqests have been submitted to DOT for approximately two years. Currently, it runs one way from Bragg to Brigham St. and two way from Brigham to Knapp St.. The Councilman informed DOT that when Walgreenâ€™s construction is completed, the problems will become even more pronounced. Some suggested that the street be made one way toward Gerritsen, and that it be designated as â€œright turn onlyâ€ to increase safety. Concerns were also expressed about the wisdom of having a bike lane that would turn right from Gerritsen onto Knapp. Theresa Scavo shared photos of an accident that occurred only days before the meeting, in which a car turning right at the intersection veered out of control and crashed into the gas pumps at the Mobil gas station immediately to the right on this corner. The issue of vehicles turning left from Gerritsen southbound onto Avenue U eastbound continues to be a major concern. For at least 20 years, local elected officials have been requesting that a left turn signal be installed to facilitate this difficult turn. Each time, it was denied, as it â€œdoesnâ€™t meet the warrantsâ€. Councilman Fidler asked whether the presence of the firehouse, with the engines not being able to get out when left turn traffic backs up might be an exception to the traditional warrants requirement. Oh, come on already! This city is supposed to be becoming more bike friendly. You people are doing this because you want to drive your cars down the avenue at 50 mph and the bikers be damned. I hope this goes through so that you have to slow down in one lane. Maybe you’ll leave your cars home for a change instead of DRIVING that block to the store for a newspaper. Admit it, you know you do that. to be clear, we are all in favor of bike lines…but want them where the bike riders want them…on Stuart and Burnett, near the park. Traffic calming measures can be taken, according to DOT, on Gerritsen withu9t bike lanes. Thanks again Lew for standing up for the concerns of the residence of Gerritsen Beach. It is already impossible to drive down Gerritsen Avenue without riding the median since there is not enough parking to accommodate all the people using the ball fields and the stores. I think that head on parking on the field side of the avenue would alleviate alot of the double parking. Also, the sidewalk on the field side is hardly used so maybe bikes could be routed that way? The intersection at Avenue U is ridiculous, there should be left turn signals. As for the average speed on Gerritsen Avenue, this neighborhood has been fighting for years for additional traffic lights but they are always deemed unnecessary. So, instead they want to make up an elaborate traffic plan? The park at Seba is being expanded, however to cross safely, children would have to walk all the way to the school to cross, does that make sense? I think you are 100% correct neighbor!! Most people riding their bikes from MP drive along the creek onto the fields side; there are no breaks in the sidewalk all the way around to the Golf Course….in theory you could ride from the End to the golf course without ever going in the street!! !…Lights have been needed here for a long time; it would curtail the speed and even the flow of traffic. A left turning signal near Key Food has been needed too!! one problem that is never addressed is the cars turning onto Gerritsen from Allen avenue. Its illegal to make a left but if the cops sat here they would make a fortune on left turning cars!!! FYI: The objection was not to a bike lane, or the use of bikes. Those present were community representatives from civic associations from the surrounding vicinity of Avenue U and Gerritsen Avenue, including of course, Chairperson of CB-15, Theresa Scavo, and elected representatives, Councilman Lew Fidler, Assemblywoman Helene Weinstein, Assemblyman Alan Maisel. Everyone at the meeting makes some use of a bicycle, and speaking for myself, I ride one almost daily, or walk to my destinations. The objection was to the design plan to have ONE LANE for bus, car and bike use at an intersection that is jammed under the most normal of circumstances. The plan includes a pedestrian island on Ave. U (On the surface, a good idea); no left turn lane (which means, no change from what it is now). The congestion is further complicated by the coming and going of cars using the Key Foods parking lot (plus a restaurant and stores on Ave. U). It will undoubtedly worsen now that there are newly built retail stores on the west side of Gerritsen Ave. and a large Walgreen’s store about to open, where the Foursome Diner used to be. Most people riding a bike in the vicinity usually use Burnett Street, rather than Gerritsen Ave. The matter of speeding was addressed, (and other than the speeders) everyone in the community agrees there is excessive speeding. WHAT REALLY CAME OUT OF THE MEETING, is that no amount of common sense, no input from the people who live in the community, no technical objection; no consideration about the increased number of businesses, no reason presented in good faith, suggesting the plan needs to be looked at again, means anything to the bureaucrats who conceived the plan. (According to Brooklyn Borough Commissioner Joseph Palmieri, the plan was conceived about 10 years ago). Palmieri’s response at the conclusion of the meeting was, it doesn’t make any difference how you think it would be better, we are going ahead with the plans as we designed them. With that, Councilman Fidler, visibly upset, said, “How imperious of you!” and added, he was going to initiate legislation to put the plans, as they were presented, “on hold”. I think we should contact the Mayor. I also think if the trucks begin the project we should stand in front of them and not allow them to proceed. We don’t need anyone else getting hurt up there. It’s a very dangerous corner. Where is everyone else on this issue? We were promised that no work whatsoever would begin until they got back to us….so…. That is so true George. Who does Palmieri listen to…the Mayor? I don’t know. It seems that he does what he wants….but knows nothing about The Community needs and wants……What has to happen here? If I read correctly what Lew From Brooklyn wrote, he will not be initiating any legislation to stop the work on Gerritsen and Avenue U…. Your guess is as good as mine as to what that will mean. Maybe it means, no work will be done until the election is over…. George, I received a phone call from the Brooklyn Commissioner back tracking a bit on the bike lane issue. I have had good results with DOT over the years so i am goign to give him a chance. The legislation may come anyway—-to wit, that the implementation of the Master Plan has to be approved before implementation by the Community Board or some such thing, and that such approval only be good for one year prior to implementation. But, let’s just see what happens here. I DO have his word that no implementation of anything will happen without him getting back to us. Wow. Gerritsen Beach would oppose a crosswalk if DOT asked them about that too. So, where can you ride a bike on Gerritsen Avenue without getting struck by a car? I commend the NYCDOT in its actions to make our streets safer for cyclists and pedestrians by installing bike lanes and working to slow motorists down. Unfortunately our community boards and elected officials do not share their commitment to safe streets and protecting the residents in the communities that they are supposed to be serving. Its time for the bike lanes to be built, these bike lanes are used and get increasing use each year. I’ve already chimed in on this issue the last time. Restricting the flow of traffic and making things narrower will NOT in any way slow down the drivers who speed through at 50mph. It just wont. Restricting the flow of traffic in that intersection WILL CAUSE MORE ACCIDENTS. DOT needs to consider how much other traffic takes place in the intersection between sticking bike lanes in as well. For example, 3 corners on the block contain parking lots and curb cuts for cars, all 4 if you include the Chinar parking lot. 2 of the corners include bus stops, on the same side no less, which automatically blocks 2 lanes. There is a fire house just off the corner as well, and 2 other traffic lights in very close proximity (Gerristen and Knapp, U and Stewart). The traffic from the Keyfood parking lot alone is constant and always snarls traffic as people try to get in and out of the parking lot. Any narrowing or restriction of the flow of traffic in that AREA WILL BE EXTREMELY DANGEROUS as drivers swirve and jerk their cars around obstacles. The only thing I can recommend for that intersection is moving one of the bus stops to the diagonally opposed corner, creating a left turn light on Gerritsen Beach Ave (South Bound), the lane should get the arrow that shows a left turn or stay straight symbol, and a left turn lane on the Northbound side. At no time should there be any sort of Median or Bike Lane at this intersection. Mark my words if you install those PEOPLE WILL DIE. Our small corner of the city has the highest DWI rate in the borough, do we REALLY want to create MORE congestion and make it EASIER for these drunks to hit people? DOT needs to wake up, and needs to realize, the goal should be decreasing congestion and facilitating the flow of traffic, not adding obstacles and targets. I see two problems with doing this though it’s a bit north of the beach. I see a new bottleneck at Fillmore & Gerritsen caused by the cars coming in from Ave S and then making the right on to Fillmore. I also see an even worse bottleneck as all this single lane NB traffic on Gerritsen tries to merge into Nostrand esp. during rush hours. I’m sure a 10 year old plan has already looked into these possibilities but what happens if I am right. Do we just have to live with these newly created traffic jams? I think that DOT at times tries to make us maybe a bit safer but totally forgets about driver convenience. Iâ€™ve already chimed in on this issue the last time. Restricting the flow of traffic and making things narrower will NOT in any way slow down the drivers who speed through at 50mph. It just wont.